Stretching and maintaining your flexibility are important parts of any exercise regimen, and stretching your upper body is just as important as stretching your lower body and legs. Upper body stretches can help prevent and relieve pain from back injuries, while keeping your spine in alignment. Try these five stretches to target several areas of your upper body. These five stretches work several muscle groups in your upper body including chest, arms and back. Try just one or all five to improve your flexibility. This stretch will help to open your chest, stretching your front, shoulders and upper arms at once. Stand with your feet slightly wider than hipbone-distance apart. Clasp your hands behind your back. If you are unable to clasp your hands comfortably, hold a towel or a strap and place your hands as close together as you are able. Raise your arms upwards behind you while you bend at the waist. Let your head hang loose and raise your arms as far overhead as possible. Keep your hands clasped and touch your palms together if you are able. This is a great stretch for targeting your arms, shoulders, upper back and chest. Stand with your feet hipbone-distance apart. Raise your arms overhead and clasp your hands. Turn your palms upward as you stretch overhead. Hold straight up for 30 seconds, then bend slowly at your waist to the right. Keep equal weight in both feet as you reach overhead to the right. Hold for 30 seconds, then bend to the left. This stretch mainly targets the triceps, but will also work parts of the shoulder as well. Stand upright with your feet hipbone-distance apart. Raise your right arm overhead. Bend your right arm at the elbow, reaching for your upper back. Place your left hand on your right elbow and gently pull down on your elbow until you feel the stretch. Hold for 30 seconds, release and repeat on the other side. This stretch works your shoulder, as well as your rotator cuff. Stand comfortably with your feet about hipbone-distance apart. Raise your right arm and bring it straight across your body, reaching to your left. Bring your left arm up in front of your right and use your left forearm to gently pull your right arm toward the left. Hold for 30 seconds, release and repeat on the other side. This stretch works the muscles through your upper, middle and lower back. It can be done on a chair or on a stability ball. Sit on a chair or stability ball with your knees bent and your feet flat on the floor. Keep your lower body still as you twist your upper body to the right. Grasp the outside of your right hip with your left hand, and reach your right arm behind you until you feel a stretch. Hold and repeat on the other side. For the best results, stretch each time you exercise, as well as on days when you may feel stiff or sore in these muscle groups. 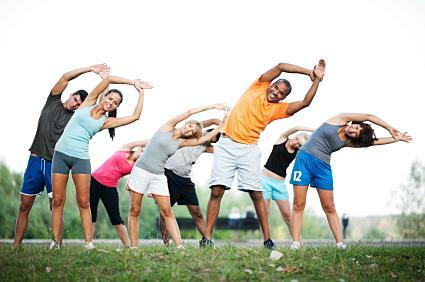 Frequent stretching will help keep these muscles flexible, which will enable you to gain more from your exercise.